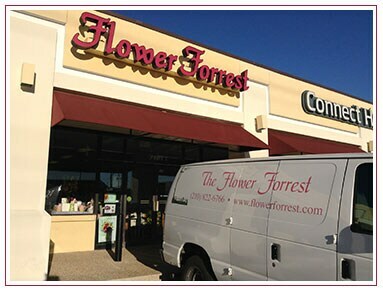 Flower Forrest has been proudly delivering the freshest flowers in San Antonio since 1986. Full service retail shop making same day deliveries throughout the San Antonio area. Texas Master Florist owned and operated with one location serving the San Antonio area. We are committed to offering only the finest floral arrangements and gifts, backed by service that is friendly and prompt. Because all of our customers are important, our professional staff is dedicated to making your experience a pleasant one. That is why we always go the extra mile to make your floral gifts perfect. Daily Deliveries to all hospitals & funeral homes.Deliveries twice per day - large delivery area - centrally located freshest flowers ordered direct from the grower- talented floral design team led by owner Gina Waters AAF, TMFA - 100% satisfaction guaranteed. Our shop will always be closed on the following holidays: Thanksgiving Day, Christmas Day, New Year’s Day, Easter, Mother’s Day, Memorial Day, Father’s Day and Independence Day. Our commitment to you is 100% satisfaction on all your floral and gift purchases. If you are not completely satisfied, let us know by calling (210)822-6766. Brady even noticed the flowers and appreciated it. When we get the pictures I will send you some because you all did some great work. I wanted to thank you for all that you did to make Brady's wedding special. The bridal bouquet and the flowers at the front of the church were just beautiful! I appreciate so much the very special consideration and help that you all were to me. To have the flowers delivered here was a huge help, and then to have you all arrange the flowers on Saturday made it all possible. I clearly could not have done it without your help! Thank you for sponsoring the beautiful Yellow Roses for Coronation. I have saved a few for my scrapbook and mementos and was so honored to receive them as I was crowned Miss Rodeo Texas this week. Such an amazing honor and I sincerely appreciate your support in making my dreams come true! We, the Miss Rodeo Texas contestants, would like to thank you for your support of our pageant and the Miss Rodeo Texas Association, Inc. Your dedication to our pageant enables each one of us to go through the most remarkable experience of a lifetime and helps to prepare us to become valued, productive citizens with high moral values. We sincerely appreciate your support of miss Rodeo Texas in all that you do for the pageant and throughout the year. If you have any questions or need more information, please contact us by e-mail at flowerforrest@yahoo.com or call us directly at (210) 822-6766. We're always here to serve you and make your flower-sending experience a pleasure.